186 Marlborough is located on the south side of Marlborough, between Dartmouth and Exeter, with 184 Marlborough to the east and 188 Marlborough to the west. 186 Marlborough was built in 1886-1887 by Antoine Xavier, builder, for building contractor John W. Shapleigh, who is shown as the owner on the original building permit application, dated November 30, 1886. 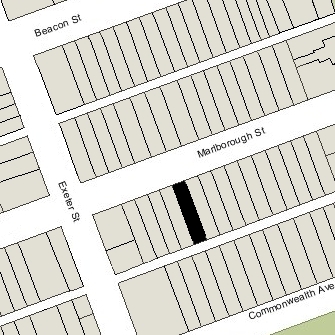 John Shapleigh purchased the land for 186 Marlborough on October 26, 1886, from iron merchant Nelson Slater Bartlett. He and his wife, Isabel Hazard (Bullock) Bartlett, lived at 272 Marlborough. Nelson Bartlett had purchased the land on February 5, 1886, from dry goods merchant Eben Jordan (founder of Jordan, Marsh & Co.). It was the eastern half of a lot Eben Jordan had purchased on September 13, 1884, from the Commonwealth of Massachusetts. Click here for an index to the deeds for 186 Marlborough. On November 11, 1888, 186 Marlborough was purchased from John Shapleigh by Ella Endora (Boyd) Williams, the wife of wool merchant Jeremiah Williams, Jr. They previously had lived in Jamaica Plain. They also maintained a home in Swampscott. 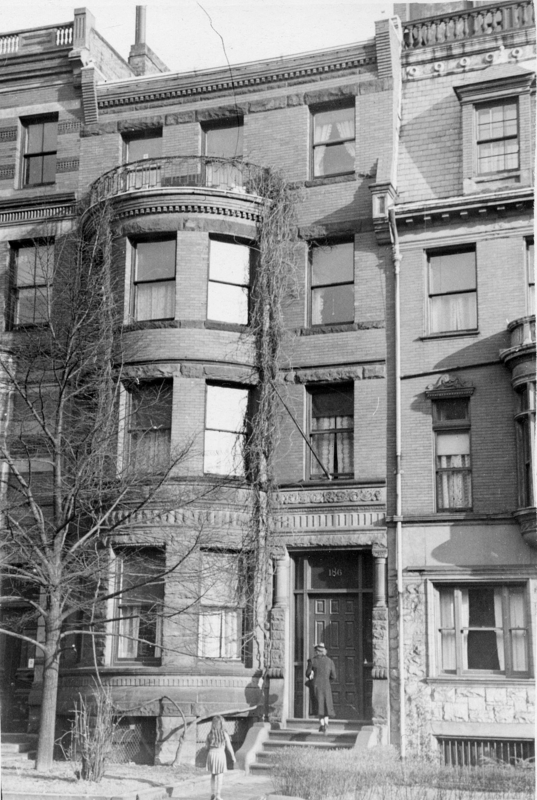 They continued to live at 186 Marlborough during the 1909-1910 winter season, but moved thereafter to the Hotel Somerset. During the 1910-1911, 186 Marlborough was the home of the Williamses’ son and daughter-in-law, Gardner Boyd Williams and Ruth Harding (Hunt) Williams. They previously had lived at the Hotel Vendôme. Gardner Williams was a wool merchant in his father’s firm. He had been a member of the US swimming team in the first Olympic Games in 1896. Gardner and Ruth Williams separated in 1911 and he moved to the Westminster Hotel (southeast corner of St. James and Trinity Place). On June 19, 1911, 186 Marlborough was purchased from Ella Williams by Walter Cabot Baylies. He and his wife, Charlotte (Upham) Baylies, lived at 5 Commonwealth. He was a cotton broker and wholesale dry goods merchant. Walter Baylies was senior warden of Emmanuel Church, and he purchased 186 Marlborough on its behalf. On February 6, 1912, he transferred the property to the church. Emmanuel Church acquired 186 Marlborough to be its Rectory, the home of Rev. Elwood Worcester and his wife, Blanche Stanley (Rulison) Worcester. They previously had lived at 80 Marlborough. They also maintained a home at Palfrey Lake in New Brunswick. Elwood Worcester was Rector of Emmanuel Church from 1904 to 1929. While at Emmanuel, he began working with a group of pioneering physicians and psychotherapists – including Joseph H. Pratt, Richard C. Cabot, James J. Putnam, and Isador H. Coriat – developing a method of treatment of nervous diseases which combined medical treatment and spiritual support. The approach, called the “Emmanuel Movement,” was considered successful in treating a number of patients. In the mid-1920s, he was a founder of the Boston Society for Psychical Research. In 1929, Rev. Worcester retired from the Emmanuel Church and on August 1,1929, he acquired 186 Marlborough from the Church. He and his wife continued to live there; their daughter, Constance Rulison Worcester, lived with them. After his retirement, Rev. Worcester established The Craigie Foundation, located at 176 Marlborough, to continue his work. Blanche Worcester died in February of 1940, and Rev. Worcester died in July of 1940. 186 Marlborough was inherited by their daughter, Constance. In October of 1940, John Sjodin, as agent for Constance Worcester, applied for (and subsequently received) permission to convert the property from a single-family dwelling into a lodging house. He lived at 188 Marlborough and, two years earlier, had converted 188 and 190 Marlborough from single-family homes into lodging houses. 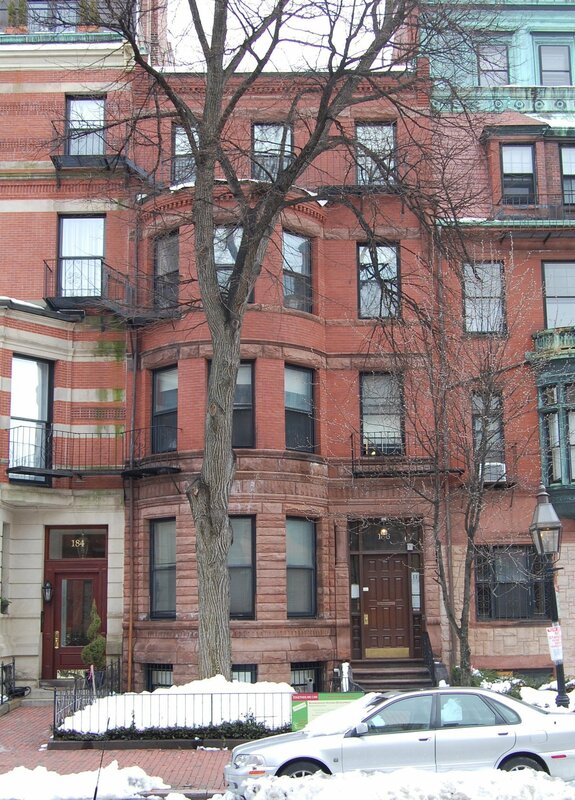 Constance Worcester continued to live at 186 Marlborough, maintaining it as a home for the elderly and poor. Constance Worcester died in August of 1986. and on December 21, 1988, 186 Marlborough was acquired from her estate by Boston Aging Concerns – Young and Old United, Inc. Included in the deed was a covenant to ensure that, for the next thirty years, at least half of the units would be rented as housing for low-income and/or occupants over the age of 55. The terms of the covenant were to be enforced by the Episcopal City Mission. In January of 2010, the Caritas Worcester House, LLC, purchased 186 Marlborough from Boston Aging Concerns – Young and Old United. The deed contained no covenant with respect to the use of the property. On April 18, 2012, Caritas Worcester House, LLC, entered into an agreement with the Commonwealth of Massachusetts, City of Boston, Neighborhood Housing Trust, and Massachusetts Housing Partnership Board establishing a permanent easement requiring that the property consist of 16 dwelling units, one for moderate income occupants, eleven for “very low income” occupants, and four for “extremely low income” occupants.